Most of us learned how to play a D chord very early on in our history of playing guitar. 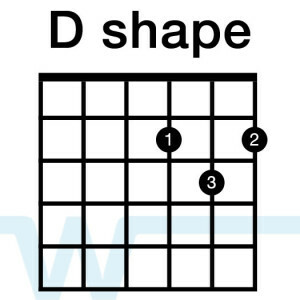 You can actually use this shape all over the fretboard to create interesting sounding chords and melodic lead playing. It is important to note that you will probably want to mute all the other strings when you play this shape. In some cases, the open strings will fit with the chord, but typically not. In the finger picking part one the lesson was T121T121 and so on. I didn’t know where this as going but in part 2 the lesson was T1213121 and it made since. This was a little more challenging than part one, but it was easy to learn. As a guitarist learning to get more serious about playing, can you give a lesson on easy lead licks and how it relates to the scale that is being played. Maybe part one and then part two. Thanks. Hi Michael, We have a series of lessons on playing lead guitar. First we teach a couple basic scales, and then how to put them together for lead stuff. Check it out in the guitar lessons section. Would be way more helpful if your video showed the fretboard when explaining concepts…. Do you mean a close-up shot? We film all these in HD, so you can full-screen the video and get a closer view. This was helpful, I just found out about you guys the other day. Great stuff! I’m learning to play guitar and hope to join the worship team at my church. I also noticed I could just barre the G & E strings with my index finger and hold the root note with my 3rd (ring) finger. I started using this because as I moved up the fretboard with the D shape, it got harder to keep my 1st & 2nd fingers in the right place. But I still prefer your way. Yes you can definitely do it that way, and in some positions this makes it easier to play. Wanna be able to play or present something in my church I don’t know how to start learning worship side of the acoustic guitar… Advice? Hi Promise – check out our Beginner Guitar Course – it’s a free lesson course that will teach you how to play. Can you do the same with all chords? I actually was looking for the answer of your question, can this apply to all chord shapes or just specific ones? I know you can do something similar to this with the F Chord shape without barring the entire fret board with your index finger.